“Seriously, where do you put it all? !” This is a phrase I’ve heard countless times throughout my life due to my craving for beige-coloured food, combined with my ability to not put any weight on. I had to do something about it. I decided to start with one of the latest fitness trends at the time: Zumba. Although I don’t struggle with learning a routine, or timing, I resembled what can only be described as one of the large inflatable men found waving about in the air outside car garages. I decided that the way forward was exercise within the privacy of my home, and so at 3am, after stumbling home from the student union one night, I found myself drawn in by the shopping channel. Through the power of a premium-rate phone call and my credit card, my Powerstep 3000 was on it’s way. A few days later I excitedly ripped open the packaging, flung the unread instruction manual to the side, and jumped straight on it. It was brilliant, the only issue was the irritable squeaking noise produced by the mechanism, which was quite distracting and annoying for my housemates who were trying to watch TV at the same time. After a while, the novelty ran out, and I looked to other forms of exercise. I dabbled in various fitness trends which didn’t suit me for one reason or another, but then one day I found one that was just right. Body Combat. It’s brilliant. You punch and kick to high-intensity music, and before you know it, an hour’s passed by. Some leave with a healthy glow, I leave looking like I’ve just walked out of the shower. I tell myself it’s because I pushed myself harder than them. Gym classes are a very popular fitness trend, as people are not only more educated, but more interested in their wellbeing. 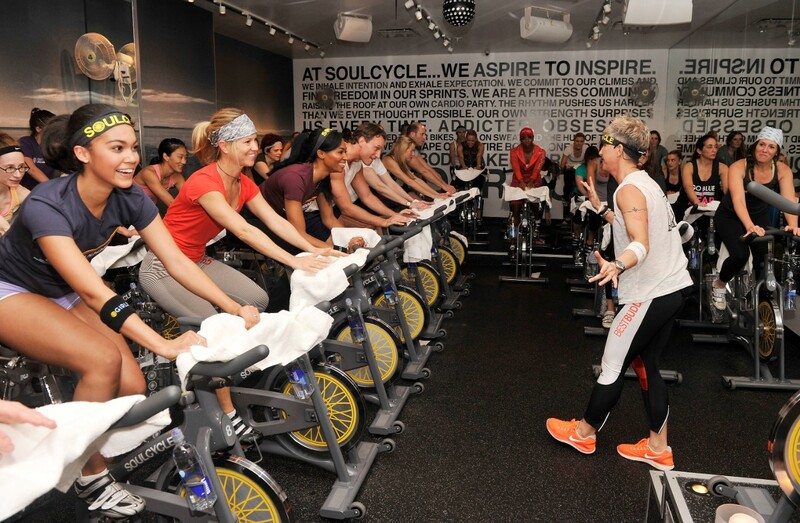 SoulCycle for example, is focused on offering a fully immersive experience, creating a sense of community and belonging within a nightclub atmosphere. As Forbes writer Clare O’Connor summarises, it is a “cardio party” and a “culture of yes”. Technology has also played a massive part in the world of fitness. The Telegraph recently counted down the top 10 fitness trends from ‘Lumo leggings’, which contain sensor technology to track your every movement, to ‘Strava’; the GPS app which plots your route, whether your cycling or running. SLM’s consumer brand “Everyone active” is a name seen across 117 leisure facilities across the UK. With such a big reach, state-of-the-art equipment, and the best gym classes I for one have ever attended, they really do have a great offering. They’ve made it their mission to encourage people to participate in 30 minutes of activity, 5 times a week, and have recently upped their game online. A refreshed website and a new app provides the ability to book classes easily and efficiently, but it could be so much more. Imagine not only being able to book classes, but to be able to see if your friends had booked too? Imagine if it could track your progress, and record your calorie/fat burn? Imagine if you could compare your progress with others? Imagine if it alerted you with ‘kick up the arse’ messages if you hadn’t been to class for a while? Maybe that last one isn’t so desirable to everyone, but you get the idea. The key to enjoying exercise is to find a way of making it not feel like exercise. And with so many options and new innovative approaches, there’s surely gotta be something out there to suit everyone.